Ideally located with easy access to the freeway, St Augustine's beautiful beaches & many attractions in America's oldest city. We did not get a paved site and there was a combination of gravel and dirt/grass so when it rains (and it poured last evening) there is a lot of mud and puddles. The site was pretty level and wide and long. We did not have to disconnect to stay the night. 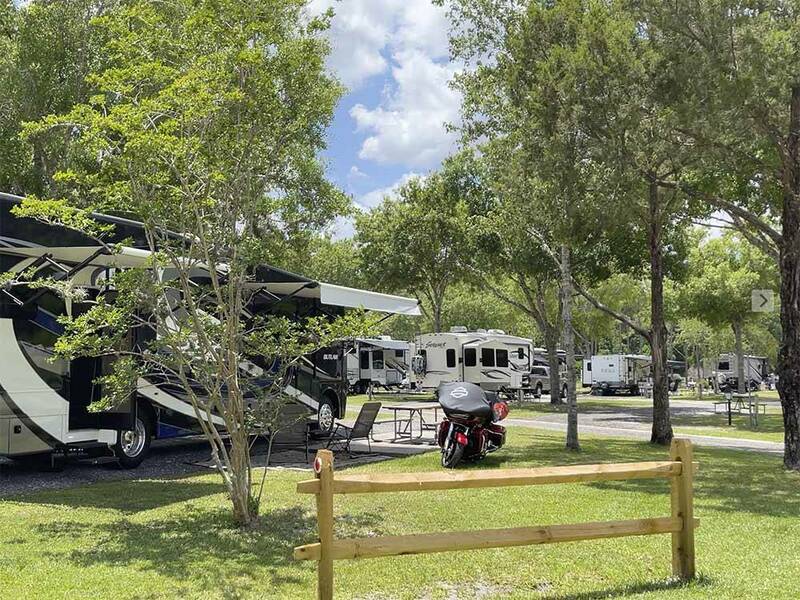 We have been to St Augustine many many times so campers who want to visit the city and all it has to offer would do pretty good staying here. Wish it was a little less expensive. wifi was good and we enjoyed our stay for one night. The spaces are a nice size at this park and the roads are paved but those are the only good things about this park. The is some gravel in the area the rv is parked but the rest of the area is grass and dirt or if it rains as it did when we were there, you have a mud hole. We stayed for a week. There are some spaces with concrete patios but we could not get one of those. The wifi is not too bad and the cable tv is not very good. There are a lot of trees so satelite tv is not available. Called 2 days ahead for a 3-night stay prior to putting the trailer in storage nearby. My pull thru spot was completely level and conveniently near the brand new (Taj Mahal quality) restroom and laundry facility. When I opted to stay another two nights they were able to accommodate me with just a move to another spot equally satisfactory. Great dog park with many stations for bags and very friendly seasonals and long term residents. Close to food, gas, outlets, Old St. Augustine and Rt. 95. We’ll be back for Christmas week and February school vacation! Thank you for a wonderful stay and looking forward to many more. 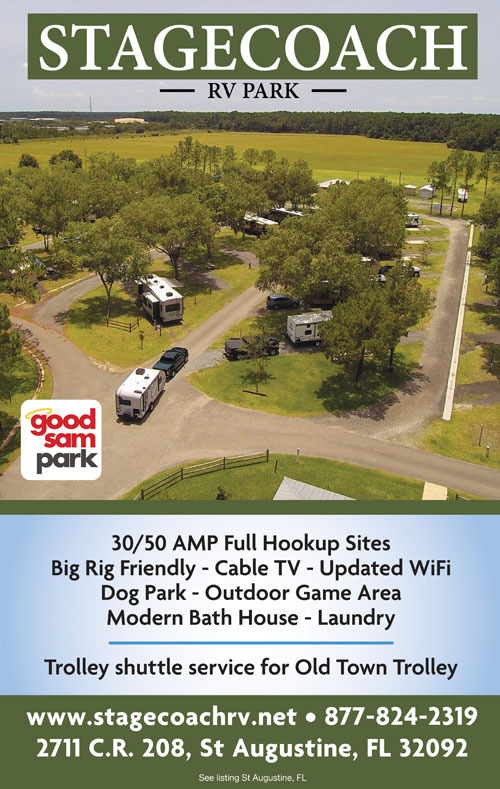 This RV park is conveniently located just off Interstate 95 about 10 miles from the center of St. Augustine. It is nicely organized with the main driveway paved and outside driveways are gravel. Site pads are gravel and most sites are pull throughs. There are trees throughout the park but we were able to use our roof mounted satellite and the park offers a cable connection. The free WiFi worked well for us. We had a long pull through with full hookups and 50 amp electric. The bathrooms were in excellent condition and were kept very clean. We paid $45.75 per night with Good Sam discount. When we arrived and attempted to hook up, we were converged on by a pack of large dogs, very agressive and barking loudly. I retreated to the coach and one tried to follow me in. The rules allow dogs, but they have to be on a leash. I would never again come here or attempt to enter this park. We spent a week. It worked but not a very nice looking park. Site was on dirt/worn out grass. No concrete patio, no nice gravel, and not real level. There was sufficient space and utilities worked. Nothing fancy. About 10 miles to historic downtown. Very interesting city. We enjoyed it. This is a basic stop over park. Very clean and well kept. Easy access with some concrete patios and gravel sites. There is no pool or dog park which we look forward to when we travel. There are outlet malls and a camping world very close by. Would definitely stay here again as a stop over right off I- 95, close to Saint Augustine which is a fun town to visit . Staff was friendly and helpful. They called us with a cancellation and filled our propane tank. WE were disappointed with this park. When we got to are site it was not well maintained it also had two large ant hills in are site which made it hard to enjoy the campsite. Also to much money for what you got. WE were glad we only stayed one night.